Please come to the first birthday party of magdas HOTEL, across the weekend of Saturday 13, and Sunday 14 February. To celebrate the birthday, Kristian Davidek (FM4) and Eugene Quinn (space and place) will play on Saturday night, from 20:00-01:00, and Jeschka Oszilat and John Megill (FM4) will rock the joint with some fine music on Sunday (10-15:30). We hope you will join us, and support this unusual and exciting project. Entrance is free. A glass of Gruner Weltliner costs just €2.20. No hotel can compete with this price. 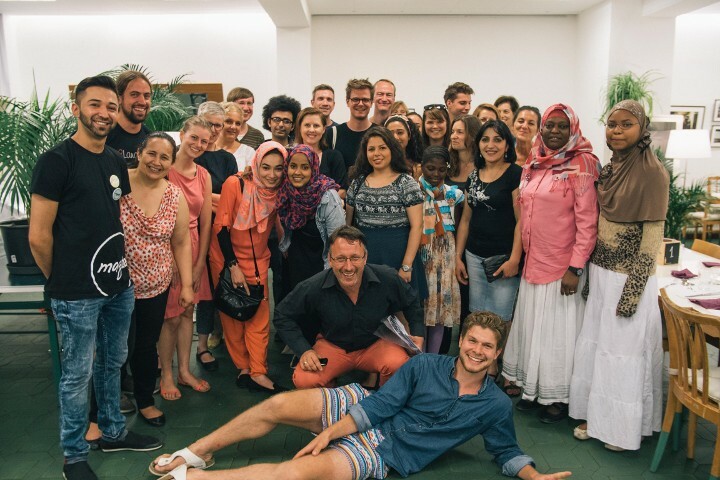 This social business from Caritas Vienna has attracted worldwide attention, as an innovative and creative solution to the general problem of how to find work for refugees. It is a cool and attractive space, and presents Vienna in an interesting and fresh way to visitors from around the world. 26 languages are spoken, and the hotel offers one of the warmest, and most charismatic, welcomes in the city. With fine food and lots of art performance, this is not a regular place to stay. And there are very few non-profit hotels anywhere in the world. Sleep in comfort, with us.